"Out of my Way!" Ben Banana is calling, the boss of the jungle monkey gang. At breakneck speed he leaps from one liana to the next. All other monkeys cannot stop gazing in amazement and suddenly he is lost from sight. On which limb is he sitting now? If you tweak the proper limbs in the jungle, you may annoy Ben and his gang heavily and pilfer their beloved bananas. But beware: only the player who has collected the most bananas will be the winner of the game. 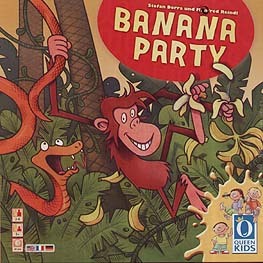 "Banana Party" is a highly enjoyable game with a new game mechanism and a thrilling 3D-setup.